These high-rise straight-leg Dries Van Noten pants are crafted from a silk blend, featuring multi-pockets, a banded waist with belt loops, a concealed zip closure at front and a multi-coloured floral print. Shown on the runway for the Fall 2010 Ready-to-Wear Collection, look 38 and 41. 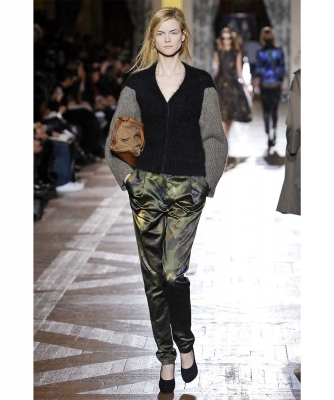 Reference photos: Dries Van Noten F/W 2010 Look 38 (Model: Kasia Struss) and Look 41 (Model: Ann Kenny).